Starfield art exhibit lets you swing over the stars. 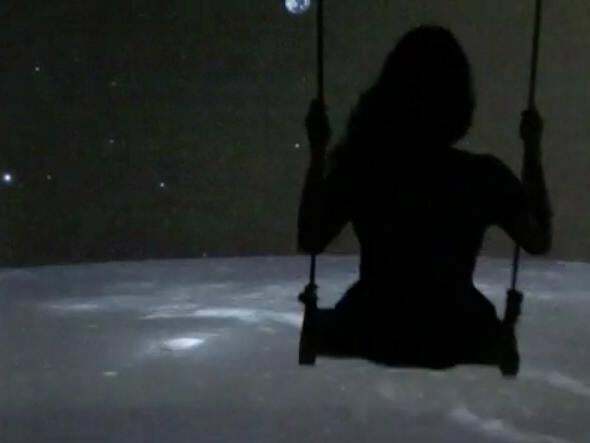 Take a swing at the Moon. Why? Well, for one thing, it’s a swing. But not just an ordinary piece of playground equipment: It’s connected to a Microsoft Kinect that uses the height of the user’s eyes, measures the angle of the ropes holding the swing, then calculates the trigonometry necessary to make it look like you’re swinging over the galaxy itself! Starfield by Lab212 from MuDA on Vimeo. I love this. What fun! And because the projection is digital, it can be swapped out with any data where 3-D info is available (or can be simulated). You could swing over the Moon, or a black hole, or Saturn’s rings … or scenes on Earth like, say, Angel Falls or the top of K2. Starfield uses data from the WorldWide Telescope, too. The idea comes from a French art collective called Lab212 (they have a lot of other cool experimental art installations worth checking out, too), and was originally created by Cyril Diagne and Tobias Muthesius. It’s at the Museum of Digital Art in Zürich. I make no bones about having a weak stomach; reading in a car makes me ill, and playing on a kid’s swing can be somewhat touch-and-go for me. So I wonder if riding on Starfield would be a good idea for me. Still, I’d love to find out. What a wonderful and lovely idea. Math! Science! Art! They’re all related; a combination of how the Universe is and how we experience it. When they are intertwined, it enriches them all.